Maddie is an adorable tween that shares her life with family and friends on her own YouTube channel. Some of her most recent videos were focused on her efforts to redecorate her bedroom in a Paris theme. 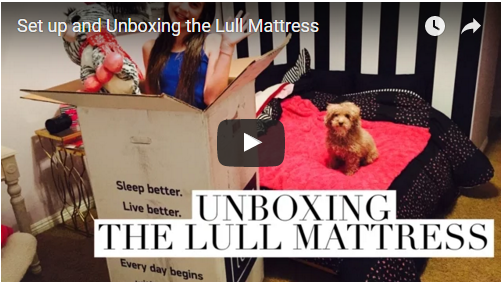 In this video, Maddie shares her experience with unboxing and setting up her new Lull mattress to help bring her new room together. Maddie starts by sharing the Lull slogan and a little bit about her new mattress, letting her audience know that it comes with a 100-night trial and came right to her door. She then shares some quick tips for setting up a Lull mattress, such as making sure to have the box near the bedframe before opening it, positioning the mattress on the bed frame before unrolling it, and making sure not to cut the mattress when removing the plastic covering. With her parents watching and taping, and her cute little dog “helping” by wondering around the room checking everything out, Maddie then gets to work setting her mattress up. She was very impressed by the unwrapping process, especially after the mattress began to expand to its full size, declaring that it was like the Fourth of July all over again. Maddie even takes the time and trouble to update her audience about how much she is enjoying her Lull mattress after the first few nights by updating the video description. Thanks for sharing, Maddie and keep up the good work!